The Swim Pro has created a new program to address some unmet needs of parents. Many children do not fit into the group class model that other swim schools offer. The Swim Pro can help them! 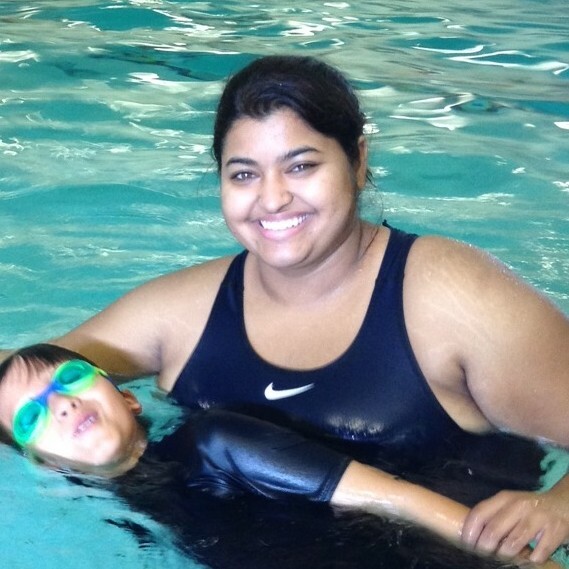 Our Toddler Pre-Swim Program is taught by Kalyani and is for children ages 1-3. The Program focuses primarily on water safety and acclimation. The class is private (1 student to 1 instructor) so Kalyani will teach at your child’s pace allowing your child to make progress at each class. And, of course, water is FUN! Once your child completes these skills and turns 3 years old they will graduate to our Child Program. Sign up by creating a profile in your child’s name on our MindBody Online scheduling system and then search for appointments with Kalyani at our Santa Clara Pool Location. You are a big part of our team and vital in making sure your child makes progress each class so please feel free to check in with Kalyani either before she begins your child’s class or during the last 5 minutes. Please be sure your child is in a swim diaper for their class to avoid accidents in the pool. Parents must stay onsite during the class but need not be in the water. This entry was posted in Uncategorized and tagged first lessons, safety, swim, swim lessons, toddler, water safety. Bookmark the permalink.